Hard on the heels of our handy collection of NZ social media stats, we have new stats about how kiwis use social media from Nielsen Online. “Our survey results provide fascinating insight into the online behaviour of New Zealanders and show the large numbers of consumers generating their own content on the web” says Tony Boyte, Research Director, Nielsen Online. Results also show that more than two out of every five have uploaded pictures (41%), uploaded music (12%), uploaded videos (10%) or posted a review of a product or service online (9%). Furthermore, when it comes to consuming media, almost half of the Internet population have downloaded, streamed or watched a video clip online (45%); or downloaded, streamed, or listened to music (37%). “Add to that the number of people using online directories (47%), reading newspapers or publications online (79%) – and a staggering (81%) using search engines – and we begin to see that the Internet has become pivotal as a personal communication, media consumption and research tool for New Zealanders,” says Boyte. Altogether, 1.92 million online New Zealanders have looked to their fellow internet users for opinions and information about products, services and brands. Of those who have Facebook as their main profile, 54% visit the site at least daily, and 39% are on the site for at least 4 hours per week. And from Perceptive‘s July 2010 Omnibus, 15-24 year olds engage with Facebook the most frequently (surprise!). From Perceptive’s Omnibus survey, again, 15-24 year olds spend the most time on Twitter. LinkedIn is a bit of a survivor. It’s older than most other social networks (established 2003) and it has successfully evolved from simply a place to post your resume online to a successful, business-focused social network. Yep, Bebo. It’s pretty much on life support, and virtually unusable for businesses (especially since they’re no longer selling NZ advertising) but it still has people on it. However it’s on the outskirts. 23% of mobile social networkers access Bebo on their phone. While Bebo was the king in NZ just 3 years ago, MySpace was the king of the world. Not so much any more. 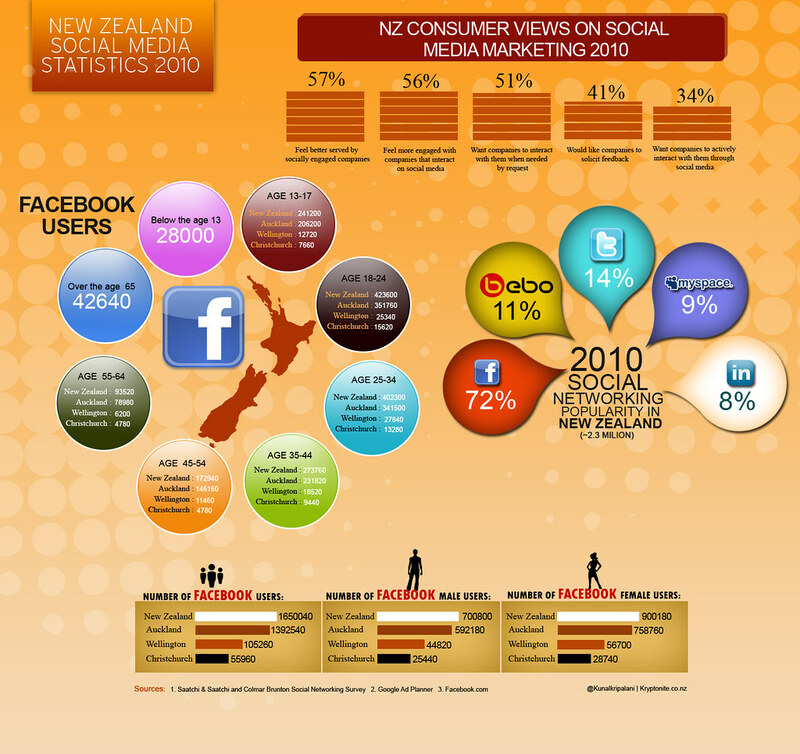 According to Saatchi & Saatchi/Colmar Brunton 9% of New Zealanders use MySpace. According to Nielsen, more people have a main profile on MySpace now (5%) than in 2007 (less than 1%). According to Perceptive, MySpace is mostly frequented by 25-34 year olds. This offers some guidance to companies who often feel caught in the “damned if you do/damned if you don’t” aspect of online engagement. Social media in New Zealand is mainstream. Businesses are active in social media and consumers are welcoming their presence. Many thanks to Jessica from Perceptive for her help putting this post together! P.S: there’s also some great information from Social Media Club Auckland’s August session on measurement and analytics.